Why do individuals vary in their responses to pathogen attacks? The stepwise infection model at the individual level of the host and its consequences for patterns of variation at the population level. The onset of infectious disease depends on a series of events, beginning with the initial encounter between a host and parasite, through to the activation of the host immune system and the exploitation of host resources. This stepwise architecture has an important influence on how we might expect disease and host-pathogen interactions to evolve. How does an the individual components of the infection process shape the overall evolution of disease? What are the relative contributions of qualitative and quantitative resistance loci to outcome of host-pathogen interactions? MD Hall, G Bento and D Ebert. 2017. The evolutionary consequences of stepwise infection processes. Trends in Ecology & Evolution, in press. Hall, M.D. & Ebert, D. (2013) The genetics of infectious disease susceptibility: has the evidence for epistasis been overestimated? BMC Biology, 11: 79. Upcoming: Hall, M.D. & Ebert, D. Contrasting the genetic architecture of qualitative and quantitative resistance. Assessing thermal limits of infected animals in large-scale water-baths. Environmental change is predicted to lead to large-scale change in infectious disease, but predicting the consequence for the severity and distribution of disease remains a difficult challenge. Global change has been linked to the increased occurrence of diseases, but more often any change in the severity or occurrence of disease depends on the form of climate change and specifics of the host-pathogen system. We seek to identity the condition that lead to pathogens or hosts becoming evolutionary winners or losers. How does infection influence the capacity of a host to withstand thermal change? Does the evolutionary potential of disease depend on the form and intensity of global change? Hall, M.D. & Ebert, D. (2012) Disentangling the influence of parasite genotype, host genotype and maternal environment on different stages of bacterial infection in Daphnia magna. Proceedings of the Royal Society B: Biological Sciences, 279: 3176-3183. Hall, M.D., Vettiger. A. & Ebert, D. (2012) Interactions between environmental stressors: the influence of salinity on host–parasite interactions between Daphnia magna and Pasteuria ramosa. Oecologia, 171: 789 - 796. Upcoming: Hector, T, Sgro, C and Hall, M.D. Thermal limts and infection. The shift between r- and K-selection on an invasion front. From "The evolution of growth rates on an expanding range edge" by Ben Phillips. The edge of an invading population coincides with low population density and high resource availability, pushing vanguard populations toward elevated rates of dispersal and reproduction. Theory shows us that these altered conditions cause rapid evolution: leading to increases in invasion speed; modified dispersal and life history traits; and, in the case of a pathogen, altered virulence. We are exploring infectious disease in light of different demographic dynamics. 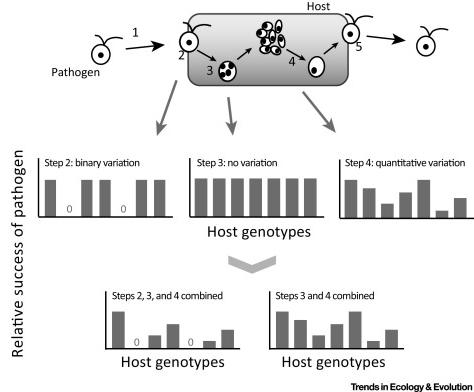 How does pathogen performance depend on the population dynamics of a host population? Are infections at the front of an expanding population likely to be more or less severe? J Michel, D Ebert and MD Hall. 2016. The trans-generational impact of population density signals on host-parasite interactions. BMC Evolutionary Biology 16(1): 254. Upcoming: Nørgaard, L.S. Philips, B and Hall MD. Infection disease on the edge.